Bonjour! Share your passion for speaking and teaching French. French teachers are in demand in BC schools. The BC Ministry of Education offers a bursary for teacher candidates who complete more than 55% of their coursework in French. We encourage teacher candidates who have been accepted into the 2019/20 BEd Program to participate in a three-week French language and culture immersion program in Quebec City on July 1 to 18, 2019. Teacher candidates who have been accepted into the 2019/20 BEd Program may apply for a one-time bursary of $2,000 to participate in the Institut de Français, UBC à Québec. This cohort is designed for teacher candidates who wish to specialize in teaching French as a second language (French immersion, Intensive French, Core French) or French as a first language (in a Francophone school) at the elementary level. Most courses are delivered and assignments are completed in French. This allows teacher candidates to continue to develop their proficiency while in the program. Practicum placements are in Burnaby, Delta, Langley, North Vancouver, Richmond, Surrey, Vancouver, or West Vancouver schools. French Immersion (Early and Late): Teach subject content in French starting in Kindergarten or Grade 1 (early), or Grade 6 (late). Intensive French: Teach French in an intensive immersion-like semester in Grade 6 and daily instruction in Grade 7. Francophone Schools: Teach subject content in French within the Conseil Scolaire Francophone. Dual Track Schools: Teach a combination of Core French and French Immersion. Please note, students who passed the former French Language Assessment (FLA) since August 2016 will be accepted based on the current DELF/DALF equivalencies. When enrolled in the Secondary French Specialist option, most of the classes are taught in French; as well, practica occur in French immersion, in regular schools offering Core French, or in Francophone schools. Learning content in French allows teacher candidates to continue to develop their French proficiency during the year. Teacher candidates may combine French with another teaching subject concentration (e.g., Spanish or Biology). French Immersion: Teach subject content in French. Core French: Teach French as a subject among general subjects in the regular English program. Please note, students who have passed the French Language Assessment (FLA) within two years of applying to the BEd program, will be accepted based on the current DELF/DALF equivalencies. French immersion option is available for the following teachable subjects: Biology, Chemistry, Earth Science, Physics, History, Geography, Social Science, Mathematics, and French language and literature. In all teachable subjects, students must complete a minimum of 6 credits of French or English Literature and Composition. Applicants wishing to teach French language and literature are required to satisfy academic requirements for French as a teachable subject. Specific secondary academic courses and experience with youth (13 to 17 years old). This year, these courses are fully funded by a grant from the BC Ministry of Education to support French BEd teacher candidates in their language development. There is no extra fee to participate; these courses are above and beyond the regular BEd program credits. Registration for Gramligne will be available from April 15 to 30, 2019. 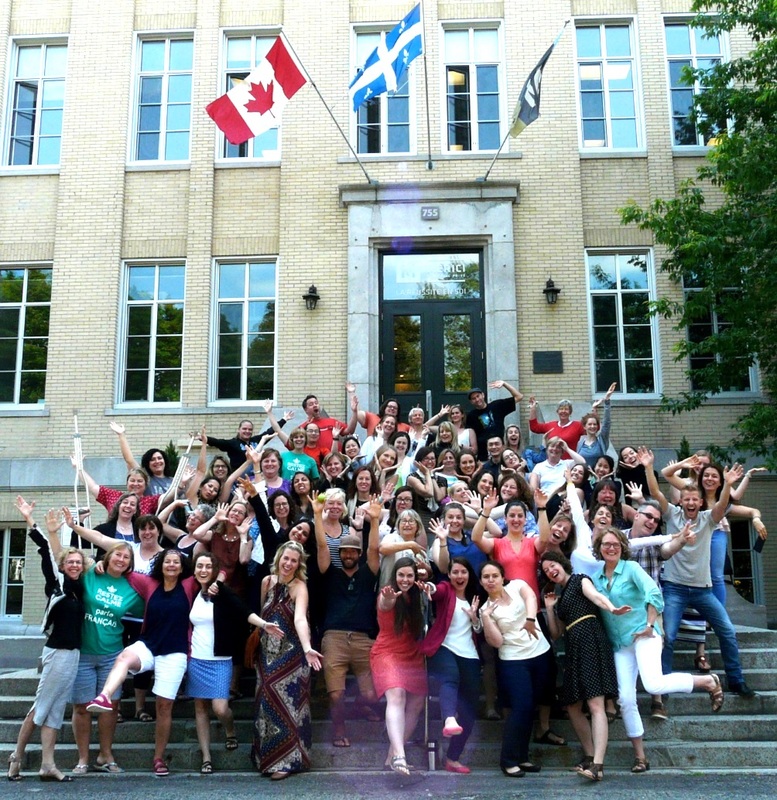 A bi-annual event that brings together French teacher candidates and educators. This weekend of fun-filled weekend of activities will be hosted in French. French language immersion in the heart of Quebec City. This is a three-week immersion program for teachers. Pour les enseignants des programmes d’immersion ou francophones, de français de base ou intensif. Ce cours basé sur des textes communicatifs dans différents discours (narratif, argumentatif, descriptif, etc.) permet d’observer et de comprendre le fonctionnement des structures linguistiques au service de la communication. Il vous permettra de comprendre les mécanismes de la langue, d'améliorer vos connaissances linguistiques et métalinguistiques et vous montrera comment enseigner la grammaire de façon communicative. How good does my French have to be to enroll in the French Teacher Education Program? UBC provides opportunities for students starting at the DELF B1 level of French to qualify to teach secondary Core French and DELF B1 to qualify for elementary French Immersion. In order to assess your level, you will need to take the DELF or DALF French proficiency test. Please note, students who passed the former French Language Assessment (FLA) since August 2016 will be accepted based on the current DELF/DALF equivalencies.Click here for a description of each level. *Please note that, for elementary immersion B1 results, a minimum score of 15 on each part. This is not required for secondary core French B1 results. Where can I take the DELF or DALF exam? When are DELF/DALF exam sessions held? There are three sittings: March, June or November at the Alliance française Vancouver or at any other testing centre in Canada or the world. Please note that a special March sitting of the DELF/DALF will be offered to teacher education program applicants by the Alliance française in Vancouver but will not be posted on its website. An application form will be posted here in January or you can contact info@alliancefrancaise.ca to receive one. What are my options if I want to be an elementary French immersion teacher but my DELF result is A2 when I apply? We recommend taking more than one DELF assessment during the week you choose (in November, March or June). The minimum level to be in the elementary French immersion stream is B1; however, the higher your proficiency result, the more competitive your file will be, so we suggest taking both the B1 and B2 assessment during the same week. The program prepares you to teach in any French second language context, and you will not only have opportunities to improve your French, you may retake the DELF at various points during the year (November, March and June), if you wish. If you achieve a higher level, you can include the most recent DELF certificate in your documentation when applying for teaching positions. Will I have the opportunity to improve my French while doing my BEd at UBC? Yes, you will have many opportunities to use and improve your French language skills. The majority of courses are offered in French and you will have the opportunity to speak with your colleagues, professors and advisors in French as well as complete assignments in French. UBC has adopted the Portfolio langagier professionel to support the continued language and professional development of each teacher candidate. In addition, you will have the opportunity to do your Community Field Experience in a Francophone community (in Canada or abroad). You will have a practicum experience in a Core French, French immersion or French Program classroom (starting with weekly visits, then a 2-week and a 10-week practicum). There will also be opportunities to take part in specially designed workshops and weekend events, such as Séjour UBC, focused on developing language, cultural knowledge, and pedagogical practices. Est-ce que les francophones doivent passer l'examen DELF ou DALF? No, si vous êtes titulaire d’un diplôme d’une université francophone et que votre relevé de notes est en français, vous n’avez pas besoin de passer l’examen DELF/DALF. All UBC French teacher candidates are eligible to receive a bursary. The only criterion is that you are enrolled in a French program for teachers or teacher candidates and that at least 55% of your courses are taught in French. Unfortunately, WKTEP students are not eligible to receive the BC Ministry of Education French Bursary. What is the amount of the bursary? The bursary amount is up to $1,600 and depends on allocation guidelines set out by the BC Ministry of Education. When can I apply for a bursary? There will be an opportunity to apply for the government bursary at the start of your program. Bursaries are dispersed by UBC Enrolment Services in the fall when course registration information is received and language of instruction percentages are calculated. Are other bursaries available for French teachers? You may be eligible for other bursaries through UBC. Are there opportunities to do the Community Field Experience in a French-speaking community? Yes, UBC has partnerships with organizations in Quebec as well as overseas. If you have more questions, contact Susan Ankenman at french.educ@ubc.ca. My love of languages, in particular, French, led me to spend a year in Quebec City at Laval University, then to complete a bachelor’s degree in French at UBC, followed by a Certificat en enseignement des langues secondes from UQAM. After teaching Core French and French Immersion for many years at the intermediate and junior secondary school level in Delta, BC, I returned to UBC to complete a Masters in Modern Languages Education. In my current role, I support the continued language development of French teacher candidates, not only as instructor of French Oral language Support, but also through initiatives like the bi-annual immersion weekend, Séjour UBC. In addition, as French Programs Administrator for the Faculty of Education, I have the pleasure of promoting and supporting French teacher education. Monique Bournot-Trites is an Associate Professor in the Department of Language and Literacy Education at UBC. She teaches second language methodology in the Teacher Education Program and courses in second language assessment, research methods and reading foundations at the graduate level. She has developed and now teaches in the French MEd cohort at UBC. Recently, she has been the project lead for writing the Theoretical Language Framework for the Canadian Language Benchmarks. She did her Master Degree (1986) in School Psychology at UBC and the title of her thesis is “Bilingualism and Reasoning Ability”. Her PhD (1998) was in Educational Psychology at UBC. The title of her PhD dissertation is: “Relationships between Cognitive and Linguistic Processes and Second Language Production in French Immersion”. Bonjour! Originaire d’Ottawa, j’en suis à ma deuxième année en tant que professeure auxiliaire et à ma première année à titre de conseillère pédagogique. Je suis toujours enseignante en immersion avec le Conseil scolaire de Vancouver (VSB), et ce, depuis 2006. Au cours de mon parcours d’enseignement en salle de classe, j’ai enseigné dans les programmes d’immersion élémentaire/secondaire, de français de base, du Baccalauréat International, et du Advanced Placement avant de devenir Chef de département des langues modernes et Mentor en littératie pour les enseignants du VSB. Je m’intéresse aux questions de compétences culturelles, de communication authentique, de littératie équilibrée et de l’enseignement du français en milieux minoritaires. Dans le programme de formation à l’enseignement, j’enseigne les cours Pratiques en littératie équilibrée et évaluation au niveau de la cohorte élémentaire et les cours Enquête I et Méthodologie du français langue seconde au niveau de la cohorte secondaire. Bonjour! Je m’appelle David Langmuir. C’est ma deuxième année en tant que conseiller pédagogique avec le TEO et je suis excité de travailler avec vous cette année académique. Onze mois de travail, de joie, de souci et finalement de succès! Ce sera une grande aventure ensemble! J’habite West Point Grey avec ma femme (enseignante, elle aussi). Nous avons trois enfants and trois petits-enfants (jusqu’au présent). Je tiens un bac en éducation secondaire de UBC (1977). J’ai fait ma maîtrise en administration scolaire à Victoria (1982) et j’ai obtenu un doctorat en Educational Studies de UBC (1998). Depuis 30 ans, j’ai été directeur d’école en trois provinces. J’ai pris ma retraite en 2015 après 23 ans à West Vancouver. At UBC, I teach part time in the Department of Language & Literacy Education. The courses I teach include: LLED 315A/381, the methodology for ELL and 2nd languages. I also teach the French sections of LLED 360 and LLED 361, the ELL discourse and ELL assessment practices. Currently, I am an Assistant Director in the Professional and Social Issues Division at the BC Teachers’ Federation. Previously, I was a Teacher/Department Head of Languages in Burnaby and I also taught Core French, French Immersion, Spanish & Social Studies for 17 years. I have also served on the BC Ministry of Education Provincial Curriculum Writing Team for Core French and Spanish. My areas of interest includes: inquiry theory, curriculum design, adult education, multi-cultural, multi-lingual & multi-modal education, language discourse, teacher education, inclusive education, somatic awareness and place-based pedagogy. Quel plaisir pour moi de retourner à mon alma mater en tant que conseillère pédagogique pour la cohorte française! Après avoir obtenu mon bac en français et mon diplôme d’enseignement, j’ai enseigné dans le programme d’immersion précoce à Abbotsford pendant trois ans. Ensuite j’ai travaillé pendant une trentaine d’années à Surrey en tant qu’enseignante, consultante, et directrice à trois écoles élémentaires avant de prendre ma retraite en janvier, 2015. Durant ces années de travail enrichissant, j’ai aussi eu l’occasion d’enseigner à Beijing, de travailler comme conseillère pédagogique à UBC et d’obtenir une maîtrise en éducation. Parmi les plus beaux souvenirs de ma carrière : la passion des enseignants débutants que j’ai embauchés, une rencontre avec monsieur Pierre Trudeau à notre école, où il voulait voir la réalisation de sa vision de bilinguisme au Canada, et la semaine avant ma retraite, un concert à mon école où une élève, réfugiée récemment arrivée, a chanté et dansé sur scène avec ces camarades de classe. Bonjour! Je m’appelle Carl Ruest. Originaire du Québec, je vis en Colombie-Britannique depuis 2001. Je suis enseignant en immersion française au secondaire à Richmond depuis que j’ai terminé mon B.Ed. ici à UBC en 2008. J’ai aussi complété ma M.Ed. dans la cohorte française et une M.A. en littérature française. J’en suis présentement à ma 3e année de doctorat dans le département de didactique des langues et de littératie, où je m’intéresse à la question de compétence interculturelle et d’interculturalité chez les élèves du secondaire, particulièrement lors d’échanges étudiants. J’ai présentement la chance d’enseigner LLED423 – Enseigner la littérature francophone aux adolescents du secondaire. Involved in Core French and Immersion programs since 1975, I’ve been active in promoting second language education in three BC school districts as a teacher, consultant and administrator. I have taught all levels from kindergarten through university. The years served as president of the BC Association of Teachers of Modern Languages and as vice-president of the Canadian Association of Second Language Teachers has provided me with both provincial and national perspectives of the complex issues surrounding second language education. Over the years, I have co-authored several works dealing with the delivery, promotion and evaluation of French language programs. Until recently, I have been principal of a single-track French Immersion school in West Vancouver. Currently, I am delighted to be a Faculty Advisor with the French Cohort at UBC in the Faculty of Education. Bonjour! Je suis d’origine allemande et depuis mon arrivée en Colombie-Britannique j’ai été scolarisée en anglais, en français, et en allemand (ma langue d’origine). Je suis diplômée en français et espagnol avec une spécialisation en linguistique et je détiens un doctorat en didactique des langues secondes depuis 2013. Actuellement, je supervise et donne des cours dans la maîtrise en éducation française à UBC dans le Département de didactique des langues et de littératie. Mes cours portent sur la linguistique appliquée, les théories et recherches sur l’enseignement des langues vivantes, et l’éducation interculturelle. Dans la formation des enseignants à UBC je supervise le programme français et j’enseigne LLED 353 et LLED 360 qui traitent de l’enseignement de l’anglais langue seconde. Dans le cadre des études en didactique des langues secondes, je m’intéresse au plurilinguisme, la formation continue et la construction identitaire des enseignants de langue, ainsi que l’apprentissage et l’enseignement du français langue seconde dans le contexte canadien. Liza Navarro is a PhD student in the Department of Language and Literacy Education. She has a background in the French language and has a Master of Arts in French from the University of British Columbia (UBC). Her research interests include language education (primarily French), intercultural competence, teacher education and open education resources. Liza’s previous experience includes instructing undergraduate French courses (beginner and intermediate French) at UBC as well as various graduate research assistant positions tied to French language learning. She is fascinated with the language and is always eager to lend a hand to French instructors and learners. This school year she will teach LLED 353 and she will be working on a small Teaching and Learning Enhancement Fund as project coordinator to provide support to French teacher candidates in helping them develop their digital competencies. In addition, she has received an Open Education Research fellowship, which will allow her to share her passion with others. Apply for the BC Ministry of Education bursary for teacher candidates who complete more than 55% of their coursework in French are eligible to receive more than $500 to offset tuition fees. This percentage may vary according to secondary program. Bursaries are dispersed by UBC Enrolment Services in the fall when course registration information is received and language of instruction percentages are calculated. Unfortunately, WKTEP students are not eligible to receive the BC Ministry of Education French Bursary. This year we are highly recommending that all French BEd students that take advantage of one or both of the 2 courses below. These courses are offered for the first time this year to support French BEd students in their language development. The courses are funded by UBC this year only, which means you will not be paying any extra fees. Please note that they are above and beyond the regular BEd program credits for which you will be assessed. Boost your confidence by spending a weekend speaking French with other teachers and teacher candidates at Séjour UBC on January 18-19, 2019. Learn more about Séjour.